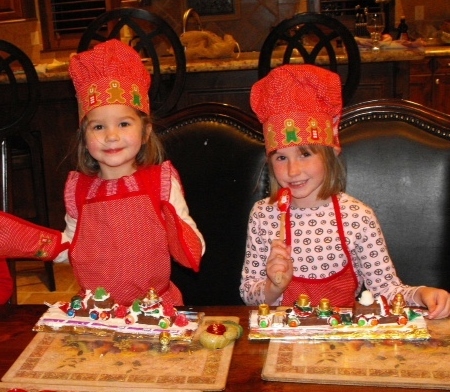 Mix three wonderful items – kids, Christmas, and candy – and create some fun and lasting memories by making candy trains. They are magic because they disappear before New Year’s Eve. 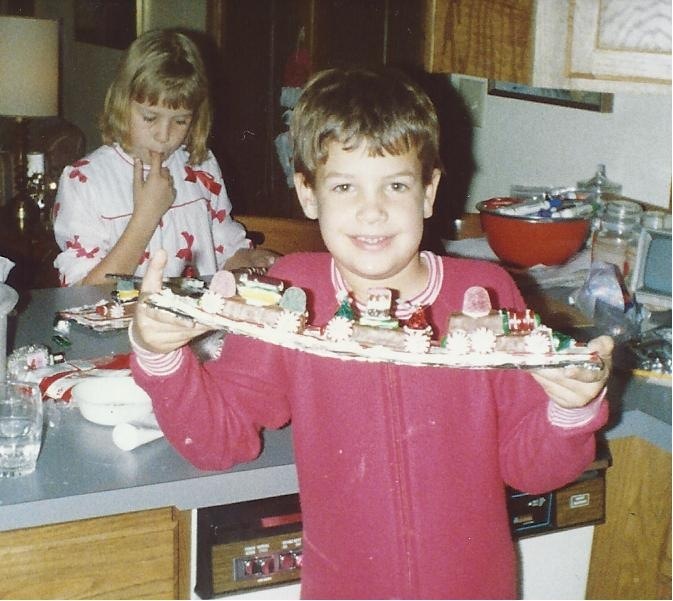 We first made candy trains more than thirty years ago when my two children were toddlers. Now, their children and I meet on a Saturday each December to make trains. It’s a tradition that gets better every year. The mothers and I have added a new ritual that makes everything more festive: we enjoy a glass of wine while the little ones concentrate on frosting and candy. By the end of the day, everyone is happy. Sugar rush? Who cares? Spread white frosting on the cardboard for snow. Place two strips of licorice over the frosting for the tracks. Squish one candy bar into the frosting near the end of the platform. Cut a candy bar in half and “glue” with frosting to the top of the first candy bar. See the engine taking shape? Now, glue the round wheels onto the candy bar. Glue M&Ms into the center of each wheel. Glue a chocolate kiss onto the front for the cow catcher. Use unwrapped lifesavers on the engine for the smoke stack. Repeat with more cars, adding wheels and more candy. Allow the children to create their own masterpieces. We’re talking about future engineers here! You may need to establish parameters ahead of time: the designers only can eat four pieces of candy and four tastes of the frosting during the assembly. This seems like a much simpler idea than building a ginger bread house. I wish I’d seen it when mine were younger.